Or for another BIRD book or two, click here. “Christians Unjustly Accused of Polytheism” — On the Unity of Jehovah Taylor, Henry. The apology of Benjamin Ben Mordecai to his friends, for embracing Christianity; in seven letters... London: J. Wilkie, 1771–74. 4to (26.5 cm, 10.4"). vii, , 128, , v, , 60, lxiii–lxv, , 63–115, , cxxi–cxxiv, 125–205, , v, , 48, xlix/l, 49–94, xcv–xcvii, , 95–187, [1 (adv.)] pp.  First edition. The ostensible conversion of the title was actually an excuse to attack the Athanasian creed; written by the controversialist Rev. Henry Taylor and addressed to Elisha Levi, these letters “espoused the restrained Arianism of Samuel Clarke . . . and embraced the Apollinarian heresy which questioned the human nature of Christ's person” (DNB). Letters II–IV and V–VII have separate title-pages, dated 1773 and 1774 respectively. Or for more SETS, click here. The One Necessity Taylor, Jeremy. Vnum necessarium. Or, the doctrine and practice of repentance. Describing the necessities and measures of a strict, a holy, and a Christian life. And rescued from popular errors. [with his] A further explication of the doctrine of originall sin. London: James Flesher for R. Royston, 1655. 8vo (19 cm, 7.5"). A–Z8Aa–Zz8Aaa4; engr. t.-p., , 448, , 449–690 (i.e., 746), [6 (index)] pp. (pagination incorrect); 1 fold. plt. For CHILDREN / EDUCATION, click here! Early American Edition: German Reformed Hymnal Tersteegen, Gerhardt. Geistliches Blumen-Gärtlein inniger Seelen; oder Kurze Schluss-Reimen, Betrachtungen und Lieder, ueber allerhand Wahrheiten des inwendigen Christenthums; zur Erweckung, Stärkung und Erquickung in dem verborgenen Leben mit Christo in Gott; nebst der Frommen Lotterie. Germantaun: Gedruckt und zu finden bey Peter Leibert, 1791. 12mo (14 cm, 5.5"). , 126, , 127–534,  pp. (pagination erratic, several pages out of order).  Gerhardt Tersteegen (1697–1769) was a pillar of German pietism, a popular and innovative poet noted for his use of free verse, and (along with Joachim Neander) one of the two most significant German hymnographers of the 18th century. First published in 1729, his “Spiritual Flower Garden for Ardent Souls” contains “end-rhymes,” “meditations,” and hymns. The first American edition appeared in 1747; this is the fourth. Or for more BLACK LETTER, click here.  First number of the first U.S. edition of this charming, humorous Bildungsroman, here in the publisher's original wrappers. 16 in-text wood engravings adorn the text; like the illustration on the front wrapper here, they are based on the originals done by Thackeray himself. The front wrapper states “To be completed in seven numbers,” although in actuality it took eight. A nice example of a “part” of a book issued in parts. For GIFT BOOKS, click here. For BIOGRAPHIES, mostly 20th-Century “General Reading” & Inexpensive, click here.
? For Books with SPECIAL PROVENANCE, click here. Classic Illustrated German BOTANICAL GUIDE — Some Early Hand-Coloring Theodorus, Jacobus, called Tabernaemontanus. Neu vollkommen Kräuter-Buch: Darinnen uber 3000 Kräuter, mit schönen und kunstlichen Figuren, auch deren Underscheid und Würckung samt ihren Namen in mancherley Sprachen beschrieben: dessgleichen auch wie dieselbige in allerhand Kranckheiten beyde der Menschen und des Viehs, sollen angewendet und gebraucht werden angezeigt wird. Basel: Johann Ludwig König, 1731. Folio (38.4 cm, 15.1"). 3 vols. in 1. , 663, , 665–1529, [97 (index)] pp. ; illus.  Massive German pre-Linnaean herbal, printed largely in black letter and copiously illustrated. The first portion was originally published by Theodorus, an accomplished physician and botanist, in 1588, and the second by Caspar Bauhin in 1613 after Theodorus's death; this is the fifth edition of the enduringly popular completed work, additionally enlarged by Caspar and Jean Bauhin. As the title boasts, some 3000 plants are described herein — including, among the Americana, tobacco, New World gourds and melons, and “Indian corn” — many among which are illustrated with attractive woodcuts reproduced from Bock, Fuchs, Mattioli, and others. 53 of the numerous illustrations have been hand-colored in a pleasing and competent but not professional style, in naturalistic hues of green, brown, blue, yellow, red, violet, and charcoal. There does not appear to be any immediately obvious pattern underlying which illustrations have been selected for this coloring! Considering the A--------n R---------n Thickell, Richard. Anticipation: containing the substance of His M------y's most gracious speech to both h-----s of P----l-----t, on the opening of the approaching session.... London: Pr. for T. Becket, 1778. 8vo. vi pp.,  f., 74 pp. .
 Although this is labelled “Second Edition,” it is printed from the same setting of type as the first edition. (Another edition of 1778, also labelled “Second Edition,” is indeed entirely reset and has a shorter collation.) The work attempts to convey the substance of several Parliamentary speeches concerning the American controversy, with at least one Cassandra saying the Franco-American alliance cannot last, and another doubting the war can have any lasting effect on the British economy. Brought to You by the Royal Asiatic Society Thomas, Frederick William, ed. & trans. Tibetan literary texts and documents concerning Chinese Turkestan. Part I: Literary texts. London: The Royal Asiatic Society, 1935. 8vo (21.6 cm, 8.5"). x, 323,  pp.  First edition of the first part (only) of a four-part series on Tibetan literary texts presented by the Royal Asiatic Society in their “Oriental Translation Fund” series, this being its vol. XXXII. The Royal Asiatic Society, created in 1823, connected significant scholars of Asian Studies, such as Sir Aurel Stein and Sir Richard Francis Burton, to share science, art, and literature related to Asia. For this volume, Frederick William Thomas (1867–1956), an English Indologist and Tibetologist, collected and translated all the Tibetan literary texts then known. Several translations are prefaced by explanations of the text's origin and/or or notes on previous studies of it. Provenance: From the library of American collector Albert A. Howard, small booklabel (“AHA”) at rear. A portion of Howard's receipt for purchase, dated 1955, is laid in. Someone HAD to Be . . .
. . . NORTH CAROLINA's First . . .
Thomas, Joseph. A poetical descant on the primeval and present state of mankind; or, the pilgrim’s muse. Winchester, Va.: A. Foster, pr., 1816. 12mo (13 cm; 5.25"). 219, [1 (errata)] pp.  Somebody had to be North Carolina’s first native born poet and the task/honor was Joseph Thomas’s, and he did it with A Poetical Descant! It is scarce, having been printed in small format in a small town by a very small-time printer for a rather small audience. Thomas’s other publications include a hymnal and short works of theology (totally fitting given that he was an itinerant preacher), and an autobiography. “Come, Gentle Spring, Ethereal Mildness, Come” Thomson, James. The poetical works of James Thomson: comprising all his pastoral, dramatic, lyrical and didactic poems and a few of his juvenile productions: with A life of the author. London: William Tegg & Co., 1850. 18mo (16.3 cm, 6.375"). lxxii, 681,  pp.  Handsome second edition of this collection of poetry by James Thomson (1700–48), writer of the British patriotic song, “Rule, Britannia!” and best known as author of “The Seasons” — a tetralogy of lengthy blank-verse celebrations of the countryside's landscape that influenced not only poets but artists such as Thomas Gainsborough, J.M.W. Turner, and Joseph Haydn. Patrick Murdoch's short biographical piece on Thomson is included here, as well as a preface by James Nichols and notes from the editor. Stunning engravings signed by English engravers John Gilbert and William Greatbach appear throughout, protected by tissue guards. Binding: Dark teal(?) morocco darkened to black with beveled boards and intricate decoration in blind; gilt lettering and additional blind decoration to spine. Marbled endpapers, all edges gilt and gauffered. Binder's ticket of Poulter of Leamington on front pastedown. Evidence of Readership: Two rather interestingly late-dated notes of reading completion (August and September 1942), in pencil in margins. Provenance: Signature and initials of V.C. Turnbull on verso of front free endpaper; another owner's notes on place/price of purchase on the same page. For more TEXANA, click here. Cannot Fail to Interest the Lovers of the Fine Arts. . . .” Thurston, John. Illustrations to Puckle's club: printed (for the proprietor) in colours, from the original blocks, and limited to one hundred impressions. [London? ]: Printed (for the proprietor) [by R. Ackermann], 1820. 8vo (24.6 cm; 9.75"). pp, 24 color plates. The engraved illustrations from the 1817 edition of James Puckle's The Club. This is an alphabet of fools, knaves, and other types of immoral or unpleasant characters with one “wise” exception only, presented in 25 wood engravings printed in colors, produced from the original blocks and mounted on India paper. English engraver and illustrator John Thurston designed them and John Thompson, the English wood engraver best known for his work in History of British Birds, cut them; each rectangular image is set within a printed double-ruled border and its subject is labelled (e.g., “Buffoon,” “Hypocrite,” “Swearer,” etc.). Puckle's story, a moral dialogue between a father and son, has been reprinted numerous times. 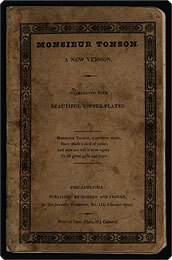 The edition with Thurston's illustrations was reprinted as recently as the year 1900; the wood-engraved monogram of Edward Walmsley, editor of the original 1817 edition, appears on the title-page of this volume. Binding: Original red paper–covered boards with black lettering and double-ruled border to title on front board. WorldCat has located only ten institutional copies.